I hope that all of you had a great break. I am excited to have students and staff back at school because it gets pretty lonely and heavy with desk work for me during breaks when no one else is here! The end of the week was a bit of an emotional roller coaster. In 24 hours we buried my favorite uncle and then turned around and celebrated a wedding for a relative. I did meet a "Most Interesting Man in the World" candidate at the wedding, however. In attendance was a guy named Richard Bird. He is in his 70's now but "back in the day" he was in the Guinness Book of World Records for running the most marathons in a year, 71 to be exact. Of course, I had to "Google" him and learned that aside from the world record, he led a very interesting life. Cool! Recognition for School Safety: The beginning of break was pretty rewarding when we learned that we received Titanium with Honors level recognition for the annual Utica National School Safety Excellence Award program. The checklist is about sixty pages when completed and includes every facet of school safety including plans, training, inventories, committee work, emergency communication, and low "risk" exposure. We will receive the award officially at a ceremony later this spring. Congratulations to all involved in helping us reach this goal. 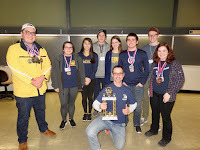 Updates on Competitions: Congratulations to the Academic Decathlon Team. 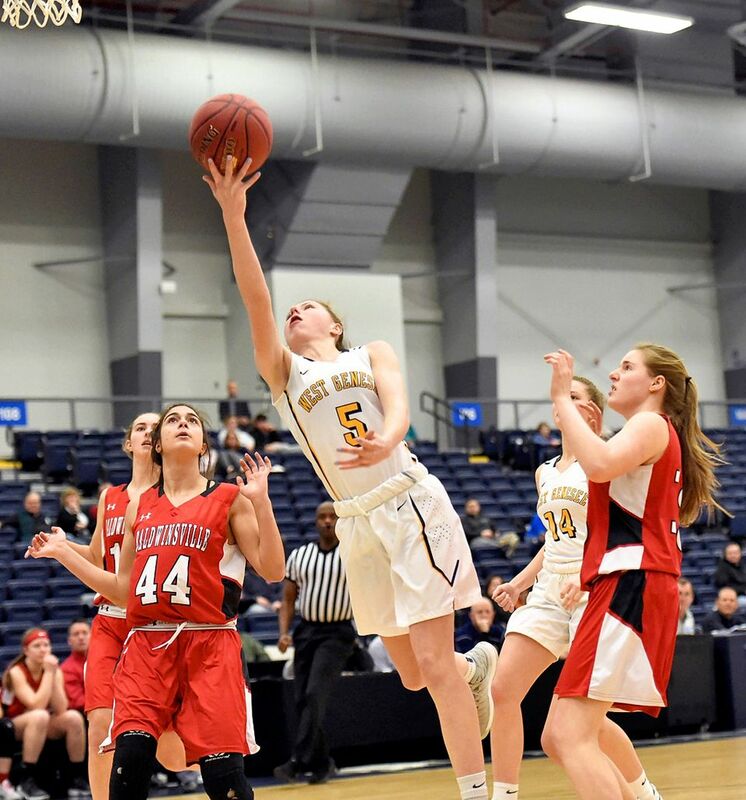 They finished third overall in the New York State Championship and had an enjoyable season overall. Our Lady Wildcats Basketball Team is capitalizing on hard work, dedication, and momentum. They defeated Baldwinsville last night at SRC arena and are now headed to the Section 3 Championship on Friday, March 2, at 8:00 p.m. at the Carrier Dome. Good luck to them! Next weekend is busy with the Culture Fair from 12:00-3:00 p.m. at the high school on Saturday, March 3. Girls Cheerleading and track athletes are competing for a New York State Championship. Listening Sessions: This week is busy for me as well with lots of listening. I am meeting with class officers and student council representatives on Tuesday; the Board of Education and community members Wednesday night at our special Board meeting/forum; employees during my building visits; and our District Safety Team. I expect good conversations. I am also going to be circling the wagons around my Wildcat family this week. You may be used to me giving a sound byte or interview and I do so to control our message. I have already done that and now it is time for me to work with our people, and do the things I have said we are going to do. Thanks for your continued support and have a great week! I hope that you are enjoying the final leg of winter break. We got a couple of really warm days, some cold days, some snow, and some rain; typical Syracuse! It was nice to run in shorts and a tee shirt a couple of mornings though. Winter Athletes are Busy: Even though we have been on break, our winter athletes have been pretty busy. 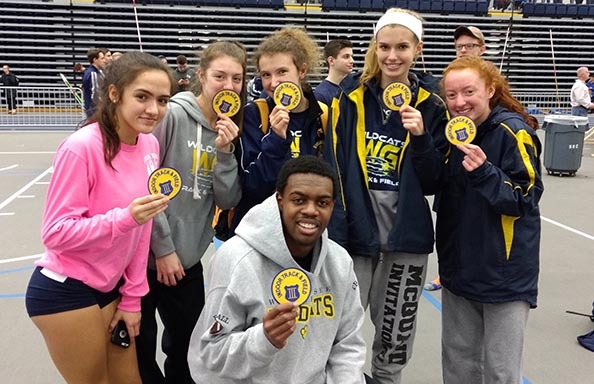 Our Girls Basketball team advanced to the semi-final sectional game that will take place this Sunday at SRC Arena; two of our wrestlers put themselves in position to compete for a New York State Championship; several of our track stars won, and are now preparing for the New York State Championship next weekend; as are our cheerleaders. Our Boys Hockey team lost a heartbreaker to Baldwinsville last night in four overtimes and two shootouts! The consolation for me, and I am sure for the parents, was watching the sportsmanship as our players and coaches congratulated and wished their opponent the best of luck moving forward. Safety Update: The last time I wrote, it was just following the most recent school shooting in Florida. I want to take this opportunity to let you know where we are at as a District seven days later, and where we will be moving forward. First and foremost, I own my words. I always have. I have always tried to make the most out of every day as a Superintendent. My job description has a lot of duties as you might imagine, and one of them is to be an advocate and voice for students. My comments about thoughts and prayers meaning nothing, my views on mental health resources and some kind of gun control sparked reactions both positive and negative. To clear the air and make sure that my consistent readers and supporters have a clear understanding of my position, I offer the following. I am faith-based. I feel that there is a time for thoughts and prayers, but there is also a time for action, and I just feel that we missed the boat on that. On gun control, I own guns. When I had time before I was a Superintendent, I hunted. I would be a hypocrite to be anti-Second Amendment. I just feel that there needs to be a conversation to keep firearms out of the hands of people that are identified as being mentally ill or unstable. A National radio host referred to me as anti-religious and uber liberal. I would respectfully disagree. I am a Superintendent who does not want another school shooting, and I think there needs to be action, whatever that looks like, to get us to that point. At the end of the day you trust me to keep your children safe, educated, and happy. After any tragedy involving a school, we debrief with experts on how we at West Genesee can do a better job to prevent something similar from happening here. We are very fortunate to have such a great resource in the Camillus Police Department. They are invested in our schools, and many of the officers have children who attend our schools. I spent Tuesday with Sergeant Nightingale. Sergeant Nightingale is a New York State certified active shooter trainer. He is recognized for his leadership in this area statewide and by all police agencies. We walked each building in the District looking at points of entry, building safety plans, and anything else that should be considered to keep students and staff safe. We then debriefed with Chief Winn to develop a partnership plan. Chief Winn gave us an increased Police presence immediately following the last shooting, and we are very appreciative of that. Starting Monday we will continue to have an increased police presence in all buildings; with a twist. He has initiated an "Adopt a School" program with his officers. Basically, several officers have adopted each of our buildings. They will be meeting with building administrators, students, and teachers over the coming weeks. While on patrol they will be visiting the buildings frequently and will be working with administrators on any situations that arise.Your children may come home and say that they see the Police "a lot". That is by design. We also identified areas in the District (tactically I am not going to mention those areas in a public blog), that would benefit from some type of increased door barrier. We will be working with vendors and our School Safety Committee to determine the best devices for the different spaces we have identified. This work and subsequent purchase(s) will happen very quickly. We will also be working with our clerical staff about door and entry protocol, and we will be asking the Board of Education at a special meeting on February 28 to authorize us to add a proposition not to exceed $2M to our school budget vote in May to provide entryway enhancements to include more updated ways to allow or disallow visitors. We had intended to ask for this in the fall as a part of our larger project, but we want to get this rolling within a tighter timeframe. We will also be increasing our lockdown and active shooter drills. While all of us feel very confident that the plan we have is solid, I think we would all feel more comfortable if we did additional practice. We should also remember to say something if we see something. This can be ANYWHERE in the community. Every bit of information helps. Unfortunate situations don't just happen in schools; so we all want to be and stay connected. There is a student component to all of this, especially at the high school. They want to be heard, just like thousands of other students across the country. This is a long blog as it is so I will give you more details in my next writing, but essentially it is my job as a Superintendent to give students a time and place to assemble and speak their minds, as well as a safe environment to do so. At the same time, not all students will share the same views, just as some of you do not share my views. It is my job to make sure all of that is managed in a safe and respectful way. I have every confidence that this will happen. You should also know that as certified professionals, we will NOT tell children WHAT to say. You have my word on that. Our job is to provide students a safe venue and time for them to express themselves. I am meeting with Student Council leaders next Tuesday to see what their thoughts are. Once we know what they would like to do, we will develop a support plan around that and will make sure that it is communicated. Stay tuned. Thanks again for reading and for your support. I am going to be going over all of this in person at a special board meeting at 7:00 p.m. in the Large Group Instruction Roon next, Wednesday, February 28. If you have further questions you can always call me at 315-487-4562, email me at cbrown@westgenesee.org, or attend the meeting and ask in person. Thanks and enjoy the rest of break! By now you have heard that another school shooting has occurred and that there were fatalities. Over the next hours and days, you are going to see tweets, news articles, and broadcasts. The words "thoughts and prayers" will be thrown around like they mean something. They don't. Elected officials will argue gun control and mental wellness, as they always do, and nothing will happen. Again. My email box and phone will light up in the coming days by salespeople from "school safety" companies, trying to capitalize on this tragedy by attempting to scare parents into making us spend money on bulletproof glass and backpacks. There may even be a few calls to put school resource officers in every building. All of those things combined will not stop another school shooting from happening. Does this sound negative? It shouldn't. It should sound realistic. Our relationships with students, our knowledge of school safety plans, our promotion of "if you see something, say something", and our access to mental health care are the best things we can do to keep us all safe. Additionally, our drills need to be taken seriously, and we ALL need to understand that we are equally responsible for our own safety and the safety of the students. We are in this together every day. If there was something I could do or say to make these shootings never happen again, I would be all over it. My voice is not important enough. Collectively we can have in impact. One fish cannot survive against predators, but a school of fish can thrive in any waters We need to continue to swim together. The NUMBER ONE thing that I have thought about for the past 18 years, 24 hours a day, 7 days a week, is keeping everyone "on my watch" safe. I have studied, in the greatest detail possible, every school shooting. How did they enter the school, how did they get their weapon of choice, was the person known, what were their walking path(s) in the school, etc. It is clear that when someone wants to enter a school building, church, mall, etc. to cause harm, they will find a way; so we need to be vigilant and always ready. We have created safety plans, have practiced them thoroughly and frequently, have conducted "active shooter drills" with staff and students (our staff have even heard "live" rounds in their school buildings so they know what one sounds like), are making sure that our employees have Crisis Prevention Institute Training (I am a trainer), and are working with Upstate on trauma wound control (Stop the Bleed). All of those things make us feel prepared, and I am confident that we will execute those things to perfection should we ever need to. I hope we never need to. The bigger picture though is since we cannot rely on lawmakers and policymakers to help us, we need to rely on each other. Chief Winn of the Camillus Police Department and I rely on tips. When you see something, you need to say something. It can be in the neighborhood, at school, at the mall, at the store, at church, while you are on your run, wherever. We both need to know what is out there so that we can assess the threat level and put plans in place. It may seem like we take the information and "it goes nowhere", but I can assure you that it does. Our tabletop drills are based on things that could realistically happen in our community, and many of those exercises are based on tips that we receive. Any amount of information we can have about people, situations, or events can pay dividends in prevention of and preparedness for future acts. It costs nothing to relay a tip, but can save us in areas that you cannot put a price tag on; our safety. Thank you for reading and for being an active part of the solution. Well, I have avoided the flu but that hasn't stopped me from being on an antibiotic twice and just feeling generally awful for about a week now. I woke up this morning and finally feel like I am turning the corner. You can't call a substitute for my position; and the show must go on! Athletics Update: Speaking of putting on a show, congratulations to our cheerleaders for placing second at sectionals and qualifying for state competition. Also congratulations to Nate Wade and Devin Earl, who can now call themselves Section III Wrestling Champions and our Boys Hockey team finished the regular season at a perfect 19-0! Math Competitors at State Level: We are very proud of students Philip Martin and Kate Graziano. They competed in the New York State Math League with 650 other students and finished in the top thirty, which now qualifies them for the state meet at SUNY Geneseo on March 17. 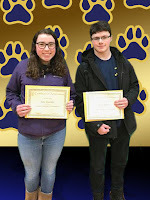 Philip and Kate are the first (and hopefully not the last) West Genesee students in over ten years to advance to this level of math competition. Congratulations and good luck! Musical at the High School: Last Thursday I was very entertained by the high school's performance of the musical Anything Goes. If you haven't been to one of our productions, you are really missing out. The pit provided professional level music, the tech and stage crews made set changes effortlessly, and the actors and actresses took me away from real life for a couple of hours. I can't ask for much more than that. Great work by all! Graduation Rates: You may have read last week that New York State graduation rates rose slightly, but gaps continue to grow in certain student groups (students with disabilities, students in poverty, and minority students). I am proud to say that our graduation rates did rise as well, but we did NOT find gaps in any certain student groups, in fact, we made gains. This makes me very happy. I never gloat about our success like others do. I expect it, and when it is achieved, we briefly celebrate then get to work improving from that spot. As I often say, we (and you) are a part of something really special, and West Genesee is where I would want my kids going to school, as mine did. Vaping: Student health is something that is important to us as well. By now you have probably heard of what a "vape" is, or what an e-cigarette is. If not, a vape is a device that is used to heat scented oils that people inhale. When modified, a vape can also be a means for smoking marijuana. In a recent survey, we found that students find plain old cigarettes to be taboo. They don't want to touch them due to the health hazards they cause. It is clear that our society has not done enough to explain the same (and worse) health concerns exist from e-cigarettes and vapes. In fact, I have spoken to parents who openly allow their children to smoke vapes at home because "it is just scented oil". TJ Vaughan, our eleventh grade principal, made it a project to get all of the current research about vapes and e-cigarettes. He shared his information with the students at the high school over the past two weeks and it started a lot of conversations. He is going to share his presentations with parents on Thursday, February 15, at 7:00 p.m. in the high school auditorium. If you are a parent of a middle or high school student (please feel free to attend if you are a parent of a child in another district) I would encourage you to attend. Thanks, don't forget about Valentine's Day, and enjoy the week. Also, enjoy mid-winter break. I will write again when we return. Winter in CNY: Well, Friday morning was interesting. I woke up at 4:45 a.m. like normal to check on the snow band that was supposed to blow through quickly, and at that time it was right on schedule to be through Camillus well before the morning commute. We checked in with local plows and our own plows and everything was good to go. Next thing you know it is 6:35 a.m. and the snow band decided to set up shop and start dumping fluffy snow on frozen roads; awesome. Unfortunately, it was too late to delay. 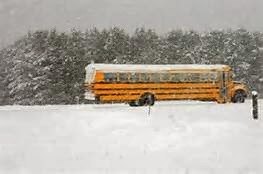 Buses were already out with kids on them. Everyone pulled together, including our parents and students, and we made it happen. There is only one person to blame on those kinds of mornings and it is me; plain and simple. The weather unexpectedly changed, and we got caught. I can vividly remember the last time this happened and it was eight years ago. The high school was in and buses were out getting elementary students. I was driving from Onondaga Hill to the District Office down Onondaga Road and up ahead cars suddenly started sliding off the road. I can remember stopping at Onondaga Road Elementary to check things out. The roads had been wet but the temperature was not supposed to drop like it suddenly had. That created instant black ice. Again, too late to make a different decision. The kids all made it in, but that morning was no fun either. Ahh, Syracuse. Planning Strategically: Besides the Friday morning commute, we had a banner week. On Wednesday and Thursday we held our annual Strategic Planning meeting. It went very well and I want to thank the staff, parent and student volunteers, and Board of Education members, and all of you who participated in our recent "Thought Exchange" for your time and effort. Once we compile all of the information, we will share it with you. Athletics Updates: Congratulations to wrestling coach Brian McAvan for being recognized as the SCAC Metro Division Wrestling Coach of the Year. Coach McAvan has really worked to revitalize our Wrestling program and the results are beginning to show. Not only did he receive that top honor, several of our wrestlers won Class AA Sectionals in their weight classes: Cole Wade at 182lbs; Victor Elias at 160lbs; Devin Earl at 145lbs; and Nate Wade at 99lbs. The entire wrestling team was also featured as the "Athletes of the Week" which you can view by clicking here. Great job boys! Cheerleading has also had quite a revitalization. Not only was the fall squad recognized as Section champions, they (both varsity and junior varsity) took first at the very competitive CNS Cheer Competition this past weekend. The sky is the limit for them! 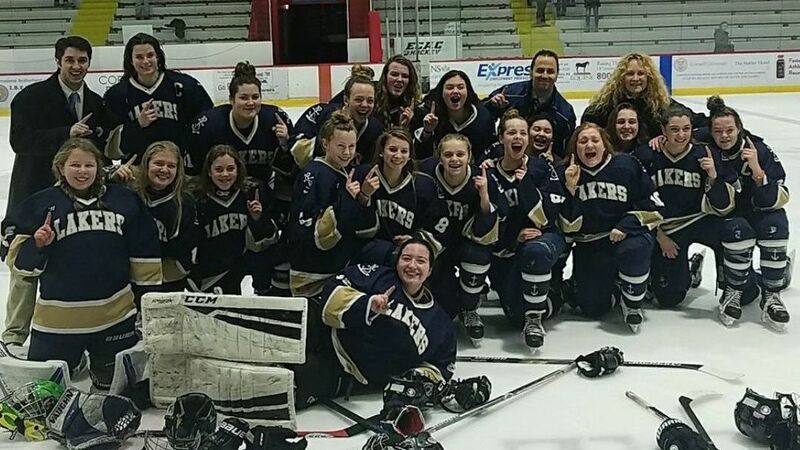 The Skaneateles Girls Ice Hockey team (with West Genesee girls on the team) won another Section III title on Sunday and is headed back to the state tournament. Congratulations! Future Business Leaders: It wasn't just sports that crushed it last week. On Friday, the Future Business Leaders of America students participated in the regional competition at Bryant & Stratton College. 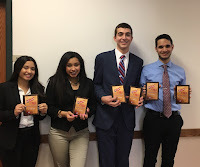 Pictured with their awards are Stacy Pertuz, Machilla Johnson, Kyle Peterson, and Brendan Bresnahan as they won competitions in Job Interview, Global Business, Business Law, Impromptu Speaking, Word Processing, and Electronic Career Portfolio. Fantastic work! Musical at the High School: Lastly, the cast and crew of the West Genesee High School Musical Anything Goes is ready for their performances on Thursday, February 8 and Friday, February 9 at 7:00 p.m., and Saturday, February 10 at 2:00 p.m. I have seen some of the rehearsals; it is going to be a great show!